The Regional Connector will allow "one-seat rides" in either direction between the Westside and East L.A., and between the San Gabriel Valley and Long Beach. Thousands of new boardings system-wide. Reduced transfers saving up to 20 minutes on some trips. An 11-minute ride from Union Station across downtown to Pico Station. Increased service efficiency. New transit stations in the employment heart of Los Angeles County. Take your pick, because the 1.9-mile Regional Connector has something for everyone. For those reasons and many others, it’s no surprise that this Measure R project scores high marks on federal cost-effectiveness evaluations. When completed, the project will connect the Blue, Gold and future Expo lines with three new underground stations, creating one seamless system. Tuesday’s meeting was an opportunity for Metro staff to update community members and stakeholders on the project’s status and to receive community feedback. Scrupulous readers of The Source will recall that the Metro Board of Directors approved the draft environmental plan in October 2010 and selected a fully-underground option for the light rail connector. Staff since then has been working on the final environmental impact report and refining some important project details. While the Metro Board opted not to fund a 5th and Flower station — the funds were needed to put the line fully underground — Metro staff is studying ways to enhance pedestrian connections between the 7th and Flower station and the Financial District. This could include widened sidewalks on Flower Street between 4th and 6th Streets, as well as pedestrian amenities — shade trees, benches, lighting, etc. — to make the 0.2-mile walk more pleasant. The dark green line is the new alignment being considered. The design of the connector will not preclude the building of a 5th Street station sometime in the future, if funding can be secured. Staff is studying a modified placement of the Little Tokyo station (see graphic at right) that would minimize impacts at the surface. The new version would reduce the amount of “cut and cover” digging and property acquisition. For more information, see slides 20-22 from the meeting’s presentation [PDF]. At the 2nd and Hope station, the station box will be roughly 130 feet below ground, creating some unique challenges. In particular, staff is looking at how to facilitate easy pedestrian movement up to attractions on Grand Avenue, i.e. Disney Hall, the Music Center, and the future Broad Museum. The next step in the process will be the release of the final environmental report later this summer or early fall. From there, the public will have another opportunity to comment before the Metro Board votes on whether to approve the Regional Connector’s final environmental report. A “yes” vote paves the way for the Federal Transit Administration to certify that the project meets federal environmental requirements. The North-South line and East-West line will share five stations downtown. During the public comment period at Tuesday’s meeting, community members made a number of interesting points. Many of them, in fact, had less to do with the construction process itself and more to do with how Metro would operate the light rail system once the connector is open. 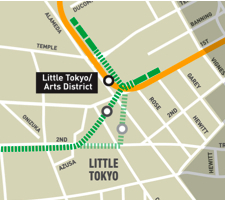 At first, Metro is planning to run a North-South line and an East-West line that will share stations between Pico and Little Tokyo. This is the most simple from an operations and wayfinding stand-point. That said, the configuration of the Regional Connector would in theory allow a variety of routes — say, a direct line between Pasadena and Santa Monica or between Long Beach and East L.A. However, according to Roybal Saltarelli, it is more challenging logistically to have light rail trains running through the system in different configurations during peak hours, when trains will be traveling through the connector segment every 1.5 minutes. Others wondered how the connector might interface with the planned downtown streetcar. In short, the two planning teams are having an ongoing discussion. However, the streetcar is still studying a variety of routes, so it’s not immediately clear if or where the two could meet up. Stakeholders from the Little Tokyo community expressed concern about how construction would impact current Gold Line operations. Roybal Saltarelli responded that staff is studying ways to keep Gold Line service uninterrupted the whole time, potentially by adding extra tracks to keep the Little Tokyo section open. There may be some inevitable service disruption, she continued, but there would be plenty of warning in advance and mitigation measures. And if you can’t make either one, the June 29 meeting will be broadcast live on Ustream. The official Regional Connector’s stream is available here — more details to follow. Or you can always send a comment by online form, telephone or email. Thanks for the update, Carter! Its exciting to hear these details being fleshed out. This thing is going to transform downtown, and the metro system as a whole. I’m glad that the MTA is looking at ways to keep the Gold Line open in Little Tokyo during construction. Also, deep subway stations are nothing new. You need escalators at Bunker Hill and maybe some extra exits near 7th/ Metro. I agree with James – deep stations have been done plenty before, and 160′ is nothing compared to some stations. For example, the Forest Glen station in the DC Metro is 200′ deep. Hampstead Station on the London Tube is even deeper at 221′. I almost prefer the streetscape improvements on Flower versus a 5th street station (particularly if the 5th street station could be built at some point after the regional connector is completed).